Mmmm, puff pastry. Anything is good in puff pastry, and this recipe is no exception. Although there are a few issues with it (which I'll help you sort out), it gives you a gourmet-tasting, rich, decadent finger food...which can actually end up as two different appetizers. The recipe is pretty simple to make (with my suggested adjustments), but the first warning to you is that the amounts are very skewed. 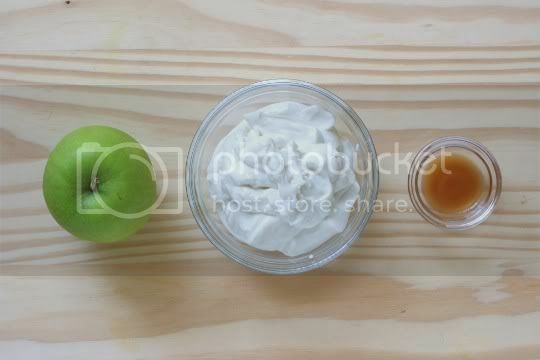 Start by making the Roasted Apple Aioli, which is basically just roasted apples pureed with mayonnaise and a little apple cider vinegar. The amounts, as is, make a TON of this stuff...and it basically just tastes like applesauce mixed with mayo, which may or may not sound appealing to you, so take heed. I would definitely start by halving the amounts. Also, it's a lot easier to roast the apple if you peel it and cut it into chunks, instead of roasting the whole apple and then having to scoop the pulp out. This will also allow you to cut down the recipe and tailor it to the amount you want. 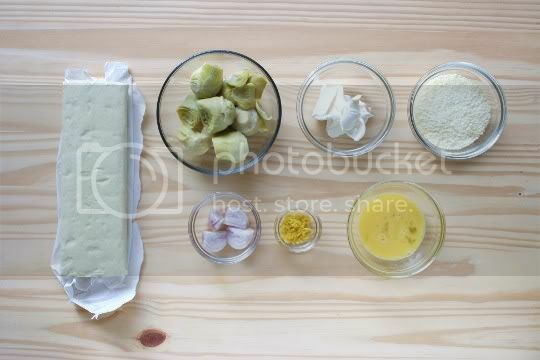 To create the turnover filling, simply add canned artichokes, cream cheese, Parmesan cheese, shallots, and lemon zest to a food processor, and pulse until combined (but still slightly chunky). Now, I found the lemon zest flavor to be a little overpowering for the other ingredients, so you may want to omit it. In fact, if I made these again, I wouldn't include it. 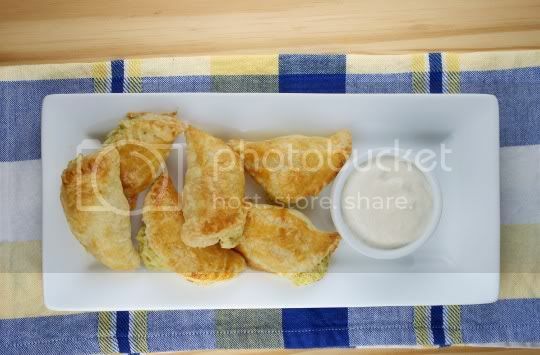 The filling amounts as listed will yield you anywhere from 1/2 to 2/3 too much for the actual turnovers. 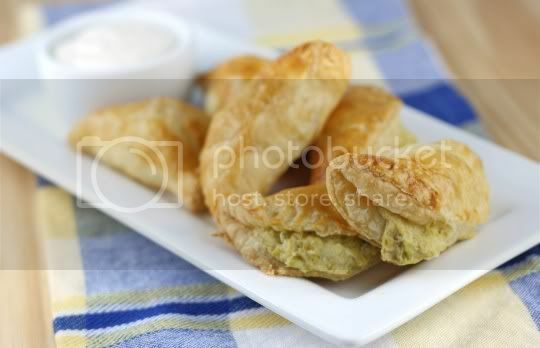 So plan on buying two packages of puff pastry to use it all up, or halve the filling amount. Or you can do what I did, and use the rest as a dip for crackers and bread (two appetizers in one!). It would probably also be wonderful as a sandwich spread. Now for the hard part: working with the puff pastry. Okay, I may be exaggerating a little; it's really not THAT difficult to work with. The key is making sure it's the right temperature and texture. 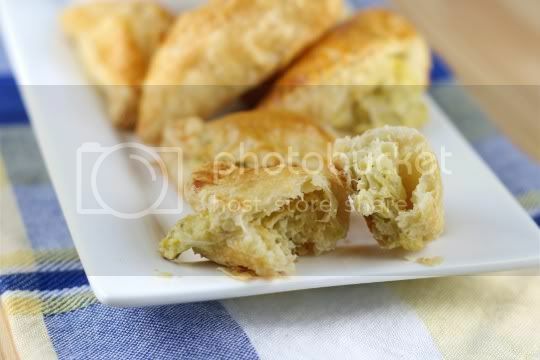 To use it, the puff pastry should be thawed from frozen, but still cold and slightly firm. This is just for you to successfully unfold it. Once that's done, you'll need to roll it out. The recipe says roll it to a 12x12 square, which won't be a lot of rolling, but I'd almost suggest rolling it out a couple inches more than that. Otherwise, there's no way you're going to get 30 turnovers (as the recipe says); I only ended up with 18. And puff pastry is not kind to reshaping and rerolling. In the end, the finished turnovers are delicious. The crust is flaky and tender, and each of the maybe three bites it takes you to finish one is filled with the salty, creamy (and lemony) filling. They taste wonderful fresh from the oven, although they aren't too bad reheated. If you only want to bake a few at a time, you can freeze the turnovers after you fill them (but before you bake them). As much as I thought I didn't originally like the aioli (and was trying to convince myself that marinara would be such a better option), the turnovers actually work quite well with it. The slight sweetness and acidity of the aioli is a nice contrast to the salty, savory filling. Make again? Honestly, I would only make the artichoke-parmesan "dip" again. Served with crudites and crackers would make a quick, simple, delicious party dish. Vegan variation: Use vegan mayo, non-dairy cream cheese, and a Parmesan substitute. You can use any unsweetened non-dairy milk for the egg wash. Very delicious! It is soft and at the same time so yummy! Once you've tasted it you immediately get hook eating it. Thanks for sharing. Just a heads up- parmesan is NOT vegetarian. it is made with animal rennet.